The diversion caused by the bridge closure. 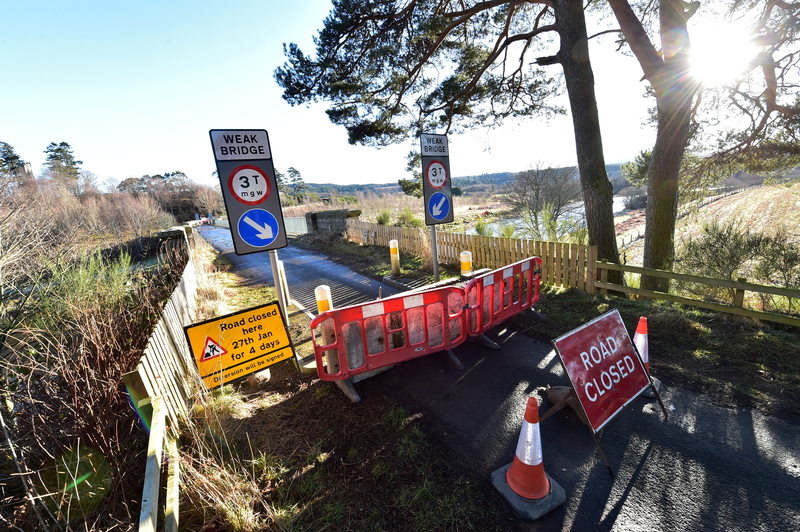 Park Bridge at Drumoak is the latest structure Aberdeenshire Council to face enforced closure due to safety concerns, with no date confirmed for its re-opening. The bridge carries the C35K road over the River Dee and is a commonly used route for motorists switching between the south and north Deeside roads. Yesterday, during a routine inspection, a number of issues were spotted and the authority’s roads and bridges team made the decision to shut the route “until further notice”. Further inspection work will be carried out over the weekend, with pedestrians and cyclists alone able to continue to use the river crossing. 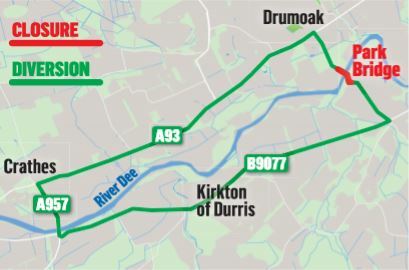 Motorists will now have to make an eight-mile round trip to cross the river further upstream at Durris Bridge, near Crathes. The authority has been racked with such problems across the region, with many of its bridges dating back hundreds of years and not designed to cope with modern traffic levels or heavy goods vehicles. The area was recently revealed as the worst in Scotland in terms of the number of bridges in need of maintenance. Figures from the RAC Foundation reveal that 65 of the 1,800 bridges on the council’s roads are substandard – more than in any other Scottish region. Aberdeenshire also came 10th in a UK-wide list. In 2017, the crossing had to be temporarily shut because roads bosses feared it would be unable to cope with the additional volume of traffic caused by the closure of the nearby Maryculter Bridge for AWPR works. The bridge during its closure in 2017. More recently, Abbeyton Bridge near Fourdoun was demolished on Christmas Day because it was deemed too dangerous. Another bridge in the village has been closed since November after inspections revealed further damage to an embankment following the demolition of a nearby house. And Gairnshiel Bridge, in Donside, has had to be closed repeatedly over the past year because of structural damage, forcing drivers to take a 24-mile detour. The authority plans to replace the bridge and close the existing one to traffic. The new crossing will not, however, be built for another two years.